Are wearing the proper gear. Safety gear is vital for protecting against head, neck, and eye injuries, as well as frostbite and hypothermia. Always make sure that you are bundled up in layers and are wearing mittens, hats, and thick boots. Before attempting any movement on skis, make sure everyone in your party is wearing a helmet, goggles, and protective knee pads or braces. Are not alone. No matter how skilled you are, it's impossible to know if you’ll suffer a bad fall or lose control. Having a friend nearby to summon the ski patrol in the event of an emergency is much safer than taking a chance by skiing alone. Are aware of your limitations. There is no shame in staying safe. Each slope should be clearly marked according to skill level and terrain difficulty. Use the beginner slopes until you’re comfortable enough to advance to harder runs. If you’re unsure of your skill level, try practicing on the beginner or intermediate slopes first to get your bearings. Are following the rules. Boundary lines and gates are placed around ski areas for a reason. You never know what kind of terrain or dangers lie beyond those markers. Consequently, warning signs are also important to obey as they give you insight into potential dangers that may lie ahead. Signs that read “cliff” or “rocks ahead” should never be ignored, no matter how curious or adventurous you feel. 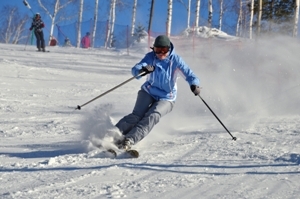 Are following skier etiquette. There is an unspoken rule among skiers that the skier or snowboarder in front has the right of way. Although you may be descending faster, if a skier is in front of you or further down the hill, it is up to you to avoid him—after all, you can see him, but he can’t see you. Following these simple precautions can help keep you safe. For more information on ski safety and catastrophic injuries, please, browse our library of blogs and FAQs. To discuss ski injury liability and compensation for a recent accident, contact our office to schedule your FREE consultation. Post a Comment to "Common Ski Injuries and How to Avoid Them"